Congratulations! You finished your novel! You typed those two sweet words THE END. Right there on the bottom of your Word doc is that magic line: Words: 96,788. Okay, now the hard work begins. Now go back and write your book again – this time in 200 words. Yes, I’m talking about back copy. I know. You don’t want to deal with it. It’s one of those tangential things like publicity, P&L statements, website algorhithms, or finding a good editor, that writers don’t want to think about but know they have to because that’s the way the book business is rolling these days. Writers have become one-man bands. We do it all or we die. If you are self-publishing with Amazon, you have to write your own back copy. 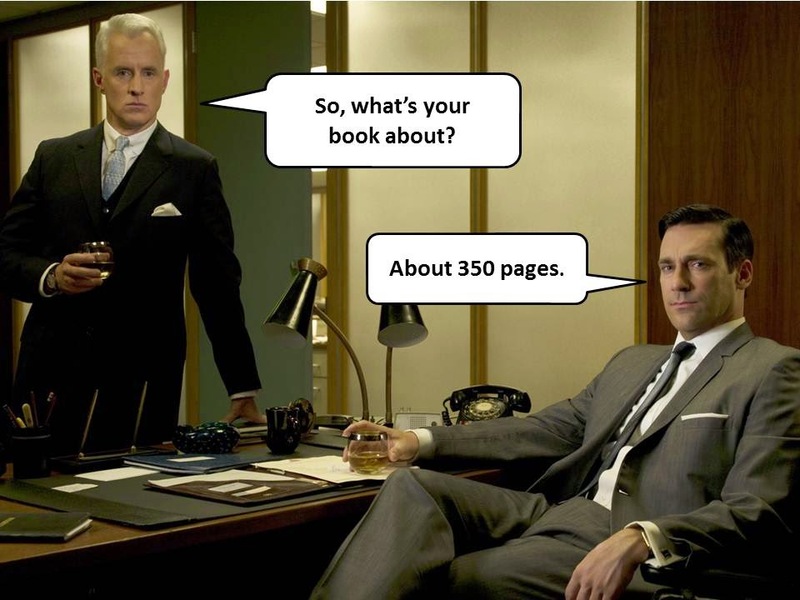 If you are going to a conference and meeting an agent, you have to be able to give a 30-second elevator pitch. If you’re doing a speech or a signing, you need to articulate what your book’s about in two or three sentences. And maybe most important: Being able to boil your story down to its very essence is a great exercise unto itself, one that will help you understand what, in your heart, you are really trying to communicate. Both of my traditional publishers, Kensington and Pocket, let us edit our back copy and a couple times we even wrote it. And we write all the descriptions that appear with our self-published backlist titles on Amazon. I’ve written my share of query letters. I had an unnerving 10-minute pitch session with an editor from Harpers at a writer’s conference. And I’ve sat at card tables in malls trying to talk people into buying my books when all they really want is directions to the Piercing Pagoda. I’m actually not bad at boiling down a story. I think it is because I made my living for years as a newspaper copy editor and once you get the hang of writing headlines that can be grasped by a guy driving by a newspaper box at 40 miles an hour, well, having 200 words to sum up a whole book doesn’t seem that hard. A father and his son walk alone through burned America. Nothing moves in the ravaged landscape save the ash on the wind. It is cold enough to crack stones and when the snow falls it is gray. Their destination is the coast, although they don’t know what, if anything, awaits them there. They have nothing; just a pistol to defend themselves, the clothes they are wearing, a cart of scavenged food – and each other. More than a year ago, mild-mannered Jason Getty killed a man he wished he’d never met. Then he planted the problem a little too close to home. But just as he’s learning to live with the reality of what he’s done, police unearth two bodies on his property – neither of which is the one Jason buried. The first is from Cormac McCarthy’s The Road. It’s good because it captures not just the plot but also mimics style and mood of the novel. The second is from Jamie Mason’s Three Graves Full. I like it because it is short and very seductive. In the summer of 1863, an eighteen-year-old Amish farm boy feels trapped between his religious heritage and his fascination with the world outside his small Pennsylvania town. His solution is to leave home. And so begins his unforgettable adventure that will change his life forever. [Title redacted] is a highly engrossing work of fiction, set in the north of England, extrapolated from the realities of the world of front line regional newspaper reporters and the sort of situations they they on a daily basis. Abused and mistreated, Jane grew up in the field of restraints which she calls a prison. And she hopes there is still an ounce of sanity left in her which leaves her with the choice of breaking away from the [title redacted]. [Title redacted] is author [redacted] new novel that looks into the lives of the people who survived the 1998 Nairobi bombings and how they struggle to cope with the pain and loss. [Name redacted] returns from the war minus a a leg and discovers that his wife has left him and his engineering business has shut down. Forced to re-invent his life, he and his family battle to overcome war’s damage. Now, these could be very good novels. But from the blurbs, there is no way to know. None of these entice readers or capture the tone or mood of the books. They are wordy (“feels trapped”), filled with cliches (“unforgettable adventure”) , vague on plot points, filled with generalities (“struggle to cope”), confusing, and devoid of any hint of conflict or suspense. Writing great back copy is a fine art. It’s nearest kin might be advertising copy in that its form is short and specialized, and its purpose is to seduce, tease, and make us buy into something. It’s no accident that some pretty good novelists emerged from the advertising industry — Don DeLillo, Fay Weldon, Joseph Heller. F. Scott Fitzgerald wrote streetcar sign slogans for $35 a week. Dorothy Sayers made a name for herself writing a mustard slogan before she got hot with crime novels. Salman Rushdie, who wrote ad copy while trying to finish his first novel, recalls taking a test for the J. Walter Thompson agency where, “they asked you to imagine that you met a Martian who mysteriously spoke English and you had to explain to them in less than 100 words how to make toast.” And then there was that guy who started out as a junior copywriter at J. Walter Thompson, rose to CEO, and turned his ad experience into James Patterson Inc. So what’s the secret? Our own Jodie Renner and James Bell laid out some great tips in a post here last year. CLICK HERE to read it. And if you want some really helpful tips from a real agent on how to write good query letter hooks, CLICK HERE to go to the Miss Snark archives. But I’d also like to offer up some of my own tips, if I may. From a helicopter high above the California desert, a man is sent free-falling into the night . . . and Jack Reacher is plunged into the heart of a conspiracy that is killing old friends. Reacher has no phone, no address, no ties. But a woman from his former military unit has found him using a signal only the eight members of their elite team would know. Then she tells him about the brutal death of one of their own. Soon they learn of the sudden disappearance of two other comrades. But Reacher won’t give up—because in a world of bad luck and trouble, when someone targets Jack Reacher and his team, they’d better be ready for what comes right back at them. A deep freeze is bearing down on the Florida Everglades, the kind of brutal storm the locals call a killing rain. For Detective Louis Kincaid, the coldest night of the year has brought a terrifying new chill — a grisly murder that tightens his every nerve in warning. This is no routine case. It’s the start of a nightmare. Watch how it looks on the page. Is it too long? Are the sentences too long and hard to digest in one quick reading? Did you break it into paragraphs, if needed? Think about the best advertising copy you see. The block of copy must register in the eye as a fast read. Alex McKnight swore to serve and protect Detroit as a police officer, but a trip to Motown these days is a trip to a past he’d just as soon forget. The city will forever remind him of his partner’s death and of the bullet still lodged in his own chest. Then he gets a call from his old sergeant. A young man Alex helped put away—in the one big case that marked the high point of his career—will be getting out of prison. When the sergeant invites Alex to have a drink for old times’ sake, it’s an offer he would normally refuse. However, there’s a certain female FBI agent he can’t stop thinking about, so he gets in his truck and he goes back to Detroit. Don’t give away too much. Good copy writing is a seduction. The back copy should make the reader want more. Think foreplay. One good tip is to pick a spot in the your plot, usually a quarter or a third of the way in, and don’t include anything that happens after that point. TV reporter Candy Sloan has eyes the color of cornflowers and legs that stretch all the way to heaven. She also has somebody threatening to rearrange her lovely face if she keeps on snooping into charges of Hollywood racketeering. Spenser’s job is to keep Candy healthy until she breaks the biggest story of her career. But her star witness has just bowed out with three bullets in his chest, two tough guys have doubled up to test Spenser’s skill with his fists, and Candy is about to use her own sweet body as live bait in a deadly romantic game – a game that may cost Spenser his life. Avoid passive voice and weasel words, clichés, twenty-dollar vocabulary. Don’t use big hard to grasp words. Again, back copy is like good advertising copy: It appeals to the senses and emotions. You can pile on the details and pretty writing inside the covers. Hint at what’s at stake. Go back and read the bad examples I listed above. Each of them has the same core problem: There is no defining of the central conflict or what the stakes are. This is a complaint I hear often from agents about query letters. A successful hook in a good query letter works much the same way as back copy does — it makes the agent want to know more — NOT about plot points but what this all means for the protagonist. On a warm summer morning in North Carthage, Missouri, it is Nick and Amy Dunne’s fifth wedding anniversary. Presents are being wrapped and reservations are being made when Nick’s beautiful wife disappears. Husband-of-the-Year Nick isn’t doing himself any favors with cringe-worthy daydreams about the slope and shape of his wife’s head, but passages from Amy’s diary reveal the alpha-girl perfectionist could have put anyone dangerously on edge. Under mounting pressure from the police and the media—as well as Amy’s fiercely doting parents—the golden boy parades an endless series of lies, deceits, and inappropriate behavior. Nick is oddly evasive, and he’s definitely bitter—but is he really a killer? FBI agent Kelly Jones has worked on many disturbing cases in her career, but nothing like this. A mass grave site unearthed on the Appalachian Trail puts Kelly at the head of an investigation that crosses the line…Assisted by law enforcement from two states, Kelly searches for the killers. But as darkness falls, another victim is taken and Kelly must race to save him before he joins the rest…in the boneyard. Mickey Haller gets the text, “Call me ASAP – 187,” and the California penal code for murder immediately gets his attention. Murder cases have the highest stakes and the biggest paydays, and they always mean Haller has to be at the top of his game. But when Mickey learns that the victim was his own former client, a prostitute he thought he had rescued and put on the straight and narrow path, he knows he is on the hook for this one. He is solitude. He is darkness. He is the ruler of the night. Yet Kyrian of Thrace has just woken up handcuffed to his worst nightmare: An accountant. Worse, she’s being hunted by one of the most lethal vampires out there. And if Amanda Devereaux goes down, then he does too. But it’s not just their lives that are hanging in the balance. Kyrian and Amanda are all that stands between humanity and oblivion. Let’s hope they win. When you’re done, read your blurb out loud. Prune out all unnecessary words. See if you can cut out 30 percent. Go into Amazon and read some blurbs in your genre for good books. Read the backs of paperbacks. Mimic the ones that work. Run your blurbs by beta readers and see if they salute. Whew. Long post today. Sorry about that. I would have written shorter if I had had more time. This entry was posted in Cormac McCarthy, Elaine Viets, Lee Child, Michael Connelly, P.J. Parrish, query letters, Sherrilyn Kenyon, Thrill Ride, writing advice, writing back copy by Joe Moore. Bookmark the permalink. Wiw. Excellent post with stellar examples, Kris. This is a rare topic, but very necessary, no matter how anyone is published. Arguably more important for the indie pubbed author who only has him/herself to rely on. I’ve always loved doing this. It’s an amazing process, boiling a book down to its essence. As you say, this book jacket summary can be used in many practical ways. My publishers always ran copy by me, but usually used my rewrite. Eventually they came to me first & asked me to write it. We reversed the usual process & they tweaked my copy. I use this book jacket type summary when I write proposal synopsis descriptions. Also my agent colloborates with me on “the pitch” she uses when I have a new book or series to submit. No author today can avoid this element of writing. Thanks for the thorough post. It wasn’t a long post. It was an interesting and informative post, and those are never too long. You know how the talented and helpful authors of this site critique first pages? Wouldn’t it be a wonderful idea if those same brilliant (too much?) and experienced authors were to offer the same advice for back copy? You know, that’s not a bad idea Amanda. It would be easy to critique since its short. Miss Snark used to do this…which is why I linked to her site so folks could see bad and good examples. Boy, do I ever need help with mine! I was surprised when I learned I had to write my own back copy, but you’re right – even with the “luxury” or a traditional publisher, the writer is a one-man band. I too have newspaper copy editing background, so that helped. These are some great tips. No need to apologize, the post may have been long, but it didn’t waste our time. Five key elements go into every successful commercial fiction. Opponent-Dig a ditch, earth resists. Opposition that fights back and resists makes for more exciting reading. Disaster-Every story needs to build to a climax with something awful. These five elements are cast into two sentences. Sentence one is a statement. It establishes characters, situation and objective. Sentence two is a question. It nails down opponent and disaster. Example: (Situation) when human beings suddenly begin to grow to twelve foot in height, (Character) John Storm, (Objective) tries to find out why. (Opponent) But can he defeat the traitors in high places, (Disaster) who want to kill him in order to make the change appear to be the result of an extraterrestrial plot. Excellent! I think your formula is very helpful. The same five ingredients that go into a big novel stew can be boiled down to their essence for the copy. I like this! Thanks for sharing, Mark G! Another fantastic post by P.J. Parrish! Kris, you really know how to offer valuable advice to authors in a clear, concise way, with excellent examples. I always look forward to your posts, and will be sharing this one on social media and to my clients! Thanks for creating such a clear roadmap for writing compelling back-cover copy. I didn’t realize you and Jim had already covered the topic last year so I tried not to repeat what you guys said. Your advice here is stellar, Kris. Definitely one to share far and wide. Thanks. And here’s something that might help writers focus their thoughts before, during, or after they’ve written the story, taken from my workshop, “Spark up Your Story – Adding Tension, Suspense, & Intrigue” which I just presented again last weekend. It’s so hard to write back copy. Fortunately, my team mates at Booklover’s Bench are great helpers in this regard. Anytime one of us needs to do a blurb, we toss it out there and each person has a go at it. This has really honed down our blurbs and made them sparkle. It helps to have writing buddies who can see the bigger picture. And it’s always easier to critique someone else’s blurb than your own. Yup…helps to have other eyes. Kelly and I work on the blurbs together and it takes us hours to get it right sometimes. PJ–this is a gift, from you to everyone who reads TKZ, and as one of those grateful readers, I thank you. Even if writers weren’t obliged these days to be all things, it would still be extremely valuable to give time and attention to the 100-word drill. Thanks again. Thanks for posting a how-to on an important part of every book. Back copy is the first thing I read whenever I’m book shopping. If it doesn’t grab me or pique my curiosity, then it’s back on the shelf. I printed this out to study later because I am going to have to address this soon for the first time. Great post. Made me go back and look at my own back copy.